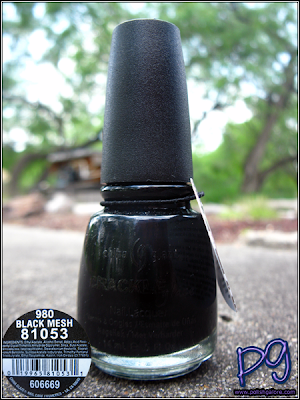 Just like OPI Black Shatter, China Glaze has Black Mesh, a black crackle polish. 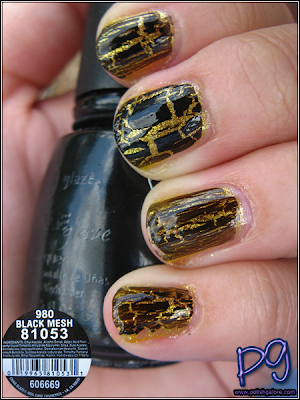 Like other shatter/crackle polishes, they do tend to get thick over time, but you can add a little bit of nail polish thinner to break up the clumps. I decided to go over my Lighthouse from earlier. On my ring and pinkie finger, I applied Black Mesh but was irritated at how watery the formula was. Well, since this has been sitting on the shelf for a bit, I decided to cap it and shake the bottle and apply over my middle and index finger... MUCH better as you can see. Sorry the focus on this is off - not sure what happened. So which is better? Honestly, they both applied the same for me. 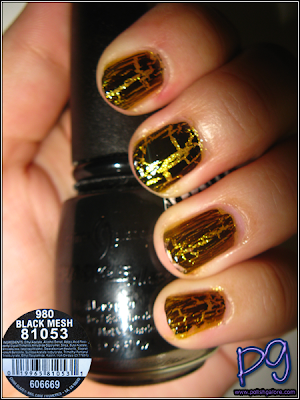 I know China Glaze Black Mesh has been hard to find in my area, but I've seen racks upon racks of OPI Black Shatter. i found it to work better when you shake it up a little too.